ZOOM! Advanced Power and Zoom IBrite LED light whitening systems are used in the practice to activate a high concentrated Hydrogen Peroxide solution and allow to achieve amazing results making your teeth 2-9 shades whiter in just 1 hour! ​Step #1 Evaluation of the patient's pre-whitening tooth shade to compare the initial tooth shade and the final result of the bleaching. a) The patient needs to have a cleaning before their treatment. Before any part of the whitening process is begun, the patient should have already had a professional dental cleaning. All tooth surface staining and accumulated tartar must be removed. It's conceivable that some people may find that just having a dental cleaning has improved the appearance of their teeth enough that no bleaching treatments are needed. Right before the teeth-whitening process is begun (and before determining the pre-treatment tooth color) the dental professional will usually buff their patient's teeth with a polishing paste so to make sure that all surface staining, including any that might have formed since their recent dental cleaning, has been removed. The peroxide whiteners that are used with professional teeth-whitening systems can irritate soft oral tissues. To protect these tissues, we will need to isolate the teeth being bleached. I use paint-on dams. 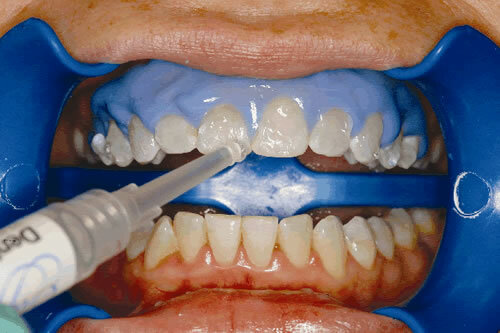 When it's placed, dental-dam gel is applied around the teeth. It prevents the whitener from seeping past and coming into contact with its gum tissue. Step #3 Eye protection and a bib covering are placed on the patient. Because of the caustic nature of the peroxide bleaching compounds used during professional teeth-whitening treatments, eye protection is required. The unexpected can happen. During the bleaching process, materials can be dropped or splashed. For these same reasons, I will place a protective bib over the upper portion of your body too. Step #4 Peroxide whitening gel is applied to the teeth. I will dry off your teeth and then apply the bleaching agent. Professional teeth whiteners are usually thick pastes or gels. I will either dab or paint it onto the surface of each tooth being treated. ​Step #5 The tooth whitener is "activated" using a light . Step #6 - The tooth whitener is left on the teeth for a prescribed period of time. In-office teeth-whitening treatments are usually completed within 45-60 minutes of appointment time, depending on the specific product being used. One whitening session may consist of 3-4 applications of the whitener. There is a possibility that sensitivity may arise during the treatment process. Depending on the specific set of circumstances experienced, we may decide to cut the treatment time short and terminate the bleaching process. ​Step #7 - The whitening treatment is completed. At the end of the treatment period, the whitening compound is suctioned and washed off. Then dental dam, and any other isolation materials or devices, can then be removed too. Step #8 - Determine the post-bleaching shade of the patient's teeth. Just like before the process was begun, after the bleaching session has been completed I will make another shade evaluation to see how much whitening has been achieved. The color you see may slightly change within 2-3 weeks after the whitening. Step #9 - Desensitizing teeth treatment. It is best for the patient to have a professional sensitivity relief/remineralization therapy at the completion of their whitening session. The application of FDA approved sensitivity relief and remineralization product such as Potassium Nitrate and Amorphous Calcium Phosphate ( ACP ), followed by fluoride application can help minimize tooth thermal sensitivity (triggered by hot and cold foods and beverages). Step #10 - (Optional) The patient continues treatment with an at-home product. I suggest that the in-office work should be followed up with the use of an at-home teeth whitening product. Usually it's a tray-based one. This type of combination treatment is fairly common. 1. Is whitening harmful for my teeth? Whitening doesn`t cause harm to your teeth. However, it might cause some post treatment sensitivity. Bleaching solution cleans and whitens your teeth by dissolving stain that penetrates micropores in the tooth structure. After bleaching those micropores are free from stain and open to the environment causing tooth nerve to feel hot, cold temperature or even air in some cases. The best way to manage this nerve exposure is to fill out the open, free from stain micropores with minerals such as fluoride, calcium phosphate, and potassium nitrate. That way you don`t just whiten your teeth, you actually make them stronger by filling out your teeth with minerals instead of stain. It also helps whitening effect to last longer. This post whitening procedure is available in my office ( see "Services" page). Whitening solution is also a good oral disinfectant. A lot of people notice that their breath improves after teeth whitening. 2. Does whitening affect composites, crowns and veneers? If you have composite fillings, crowns or veneers that were made to match the original color of your front teeth, these restorations won't whiten (whitening products can't change the color of porcelain). So if you whiten your natural teeth, your fillings, crowns or veneers may not match. The bleaching solution does not affect porcelains and composites in any way. 3. Is teeth cleaning required prior to the whitening? Teeth cleaning prior to whitening helps to remove plaque and tartar from your teeth surface to improve the whitening result. Teeth cleaning service is also available in my office ( see "Services" page). 4. Does bleaching burn gums? Temporary soft tissue irritation may occur if the whitening solution is exposed to the gum tissue during the whitening process.When soft tissue irritation occurs, the tissue generally appears white immediately after it has come into contact with whitening solution. Gum barrier gel helps to avoid this side effect. If burning occurs, vitamin E oil should be apply right away. Normally, irritation goes away within 24 hours. 5. Do you guarantee that my teeth will become snow white after the whitening procedure? Depending on the initial shade of the tooth, the results achieved after whitening your teeth may vary. There are cases where people with heavy staining or internal tooth discoloration do not notice dramatic change in the shade of their teeth after their first whitening. Internal staining, or so called "tetracycling" staining requires internal teeth bleaching normally performed by a dentist. Also, the KOR whitening system works well on tough, deep stains. Please, schedule a consultation if you are not sure what type of whitening would work best for you. People with yellow teeth get faster and more visible results than people with grey teeth. Grey shade requires longer and more frequent whitening procedures to achieve the same result as people who have more yellow shade. Sometimes it takes two or three whitening sessions in order to achieve the best whitening result and completely get rid of stain. If this is the case, then I recommend to space sessions a few weeks apart to give teeth some time to recover from whitening gel exposure. Using remineralizing gel is essential part of the whitening procedure. It helps to keep enamel pores hydrated, sealed and filled with fluoride and calcium phosphate that extends the whitening result and prevents future staining of the teeth. 6. What is desensitizing treatment and what are the benefits ? A.) Applying the fluoride foam tray for 5 min to rehydrate teeth and put the initial dosage of fluoride to help seal teeth micropores. B.) Applying the remineralizing/neutralizing gel. This gel contains active ingredients that break down the hydrogen peroxide and prevents enamel erosion, helps remineralize the teeth and reduces the nerves` ability to send a pain signal from the teeth to the brain which helps reduce post whitening sensitivity. The whole treatment lasts 10 min. This post-whitening treatment has a great impact on teeth health. When whitening products are applied to the teeth, they get inside and between the teeth. Short-term exposure is a good thing, but some of the whitening product might still stay inside of your teeth after whitening and continue oxidizing the enamel. Over hours this residue can cause some minor degradation of the teeth which isn`t a concern if it only happens once, but over a lifetime of whitening procedures, can lead to erosion of the tooth structure. The minerals of the remineralizing gel instantly react with any peroxide present ,stopping the action and protecting the teeth while the potassium nitrate reduces the pain-sensing potential of the nerves. 7. What is the best way to prevent recurring staining? All whitening gels must etch the enamel slightly to gain access to the stains under the surface. This etching is necessary, but if left in an etched state, the enamel will be more vulnerable to post-treatment staining. To maintain brilliant white teeth, the enamel should be sealed with fluoride and remineralizing gel to harden the enamel against future staining. I also strongly recommend to use professional strength fluoride 1.1 % concentration for two weeks after in-office teeth whitening. You can get it in my office or from your dentist. These steps will help to maintain healthy, strong enamel and so you can enjoy your whitening results longer. Also, for the first 48 hours it is very important to avoid foods and drinks that have too much color. Basically, the rule is whatever stains your white T-shirt will stain your white teeth during this time. Please, avoid blueberries, blackberries, red, wine, tomato and barbecue sauces. If you have to have coffee to survive through the day, please use a heat resistant straw to avoid coffee contact with your teeth. I also recommend to use gentle, pH neutral teeth whitening gels for the first few days after in-office teeth whitening to prevent "rebounding" of the stain molecules inside of the enamel which sometimes causes loss of 1-3 shades after in-office teeth whitening. 8. "I have sensitive teeth. Should I still have whitening done?" It depends on what is causing the teeth sensitivity. 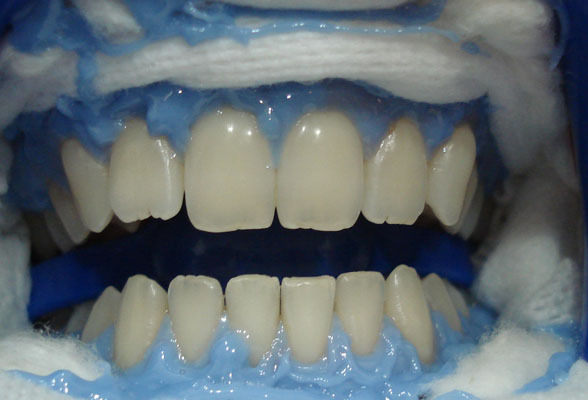 If sensitivity is caused by gum recession, then in-office whitening is a good option because gums and exposed root surfaces will be covered with a gum barrier. If your teeth are very sensitive to cold and hot on a daily basis, then Carbamide Peroxide instead of Hydrogen Peroxide and cold LED light instead of laser Zoom! light would be a better option. Sometimes teeth sensitivity can be caused by progression of tooth decay. I strongly recommend to get a dental check up within 6- 12 months prior to Zoom! whitening to make sure that there are no cavities present on your teeth. 9. How often do I need to have in-office whitening done to maintain results? It depends on how much coffee, tea, and red wine you consume. Normally, results last up to the year, although it is different for everybody. It is considered safe to have in-office teeth whitening sessions every 4-6 months depending on the type of whitening. 10. What is the difference between Zoom! teeth whitening and LED IBRITE whitening? Zoom! light is a low intensity diffused laser light that activates specifically designed whitening gel to dissolve deep tough stains. The average result is 5-8 shades in just one hour. Some people get up to 9 shades improvement depending on the initial level of teeth staining. LED light is a cold blue light with the light intensity about 450 nm. This type of light speeds up a chemical reaction in the whitening gel but doesn`t penetrate teeth deep enough and only effective on light to medium surface staining. This type of whitening is recommended for teenagers, people with increased teeth sensitivity and a convenient alternative to home whitening maintenance. 11. Why would I whiten my teeth with a dental professional if a lot of spas and tanning salons offer "professional" teeth whitening cheaper? Spas and tanning salons can`t provide professional teeth whitening service because they are not allowed by law to put their hands into your mouth. It means that they can only show you how to do this yourself. It also means that they can`t isolate your gums which often leads to chemical burn of gum tissue, sensitivity of exposed root surfaces in gum recession areas, and teeth sensitivity if you grind your teeth and have some wear on the edges. All these areas should be protected by a barrier gel that only dental professionals can use. Also, spas and tanning salons don`t have suction devices which often leads to drooling and saliva spills during whitening procedure due to increased output of saliva ( your body simply thinks that mouth piece and whitening gel are foods and sends signal to your brain to increase production of saliva in your mouth). Also, only dental professionals have knowledge of proper after whitening care that keep your teeth healthy and white. Teeth whitening has become so popular that it seems like everyone is doing it. If you want to obtain a bright and white smile, teeth whitening may be just what you are looking for. Not only is teeth whitening effective, it can also drastically change your smile and improve your self-esteem at the same time. Studies show that following your eyes, people look at your teeth when they first meet you. For the safety of my clients, inside this independent dental hygiene practice, I only use FDA registered dental and whitening products. Dental check up is recommended within 12 months prior to teeth whitening. I have an extensive experience in all aspects of whitening procedures and post treatment teeth sensitivity management that allows me to make my clients experience comfortable and pain free. I perform whitening exactly the same way as all dental offices do. My patients don’t need to worry about messy self applications of bleaching gel during whitening procedure. They just relax and use their time in the chair for a nap or enjoy music on their iphone (please, bring your own headphones) while I work on making their teeth whiter and brighter. Sensitive teeth? No problem! A variety of whitening gel strength is available and the post whitening desensitizing procedure will reduce post whitening sensitivity to a minimum.